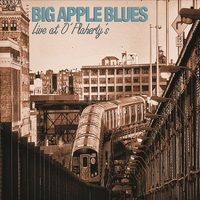 If you want to hear how Big Apple Blues really sounds live and uninhibited, this is a must have album. Recorded in a small NYC club using only a stereo microphone into 1970’s Ampegs half-inch tape recorder by one of the most revered NYC studio engineers, Hugh Pool, no overdubs or additional takes. If you were at O’Flaherty’s that night this is the energy you would have heard. Tracks range from Chicago blues grinders to Texas shuffles to jump swing propelled by time machine, Barry Harrison, and flavored by the incredible harmonica master, Anthony Kane. Zach Zunis’ signature guitar playing behind Kane’s harmonica should be made obligatory listening for all budding blues guitarists.